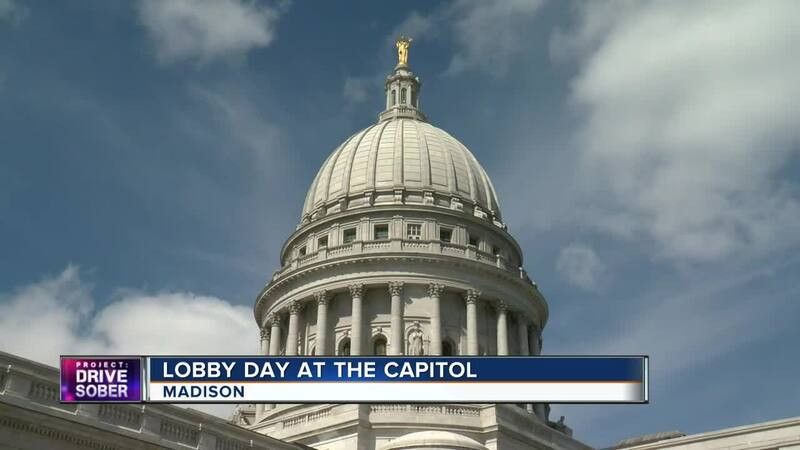 Once a year, Mothers Against Drunk Driving and the Tavern League of Wisconsin attend a 'Lobby Day' in Madison to meet with politicians about their legislative priorities. This year, victim advocates will join MADD at the State Capitol. The Project: Drive Sober team is attending to try to find out what's stopping tougher drunk driving legislation in our state. Here's Shannon Sims' recap. 6:00 p.m. -- Project: Drive Sober team member Shannon Sims shares stories of victim advocates on Live at 6:00. Tune in tonight at 10:00 p.m. when you'll hear from the lobbyist for the Tavern League of Wisconsin. Shannon Sims shares victim advocate stories on Live at 6:00. 4:43 p.m. -- Going since 8:30 this morning, victim advocates wrap up their day at the State Capitol. They were surprised they had to tell more than one lawmaker that a first-time OWI offense in Wisconsin is basically the equivalent of a traffic ticket. Next, they will attend public hearings for the Senate bills and continue their fight for tougher OWI legislation. Victim advocates wrap up their day at the State Capitol. 3:23 p.m. -- Project: Driver Sober team members Matt Jarchow and Shannon Sims interview Tavern League of Wisconsin lobbyist Scott Stenger in the State Capitol. Project: Drive Sober team interviews TLW lobbyist Scott Stenger. 2:00 p.m. -- Tavern League of Wisconsin members gather at the Capitol for meetings with lawmakers. 1:27 p.m. -- Victim advocates head into Sen. Patrick Testin's (R-Stevens Point) office. Victim advocates visit Sen. Patrick Testin. 12:55 p.m. -- Victim advocates continue to meet with lawmakers. We expect Tavern League of Wisconsin lobbyists to be in the State Capitol within the hour. The State Capitol in Madison. 11:25 a.m. -- Marla Hall says she is frustrated because she has tried multiple times to meet with Sen. Fitzgerald but he has not made himself available. Victims advocates talk with Project: Drive Sober team member Shannon Sims outside Senate Majority Leader Scott Fitzgerald's office. 11:20 a.m. -- Victims advocates pay an unscheduled visit to Senate Majority Leader Scott Fitzgerald's office. He was not available to talk, but Marla Hall and others spoke to his staff. 11:07 a.m. -- "I was not endorsed by the Tavern League of Wisconsin the last election," says Sen. Andre Jacque (R-DePere). "They told me I was too tough on OWI legislation." 10:52 a.m. -- "I lost my baby. He was the world for me. I'm going to keep this on for him," Marla Hall cries. "I will fight until my last dying breath." 10:48 a.m. -- "I lost my future. Clenton was my only child," says Marla Hall. "You are not safe on Wisconsin roads any time." 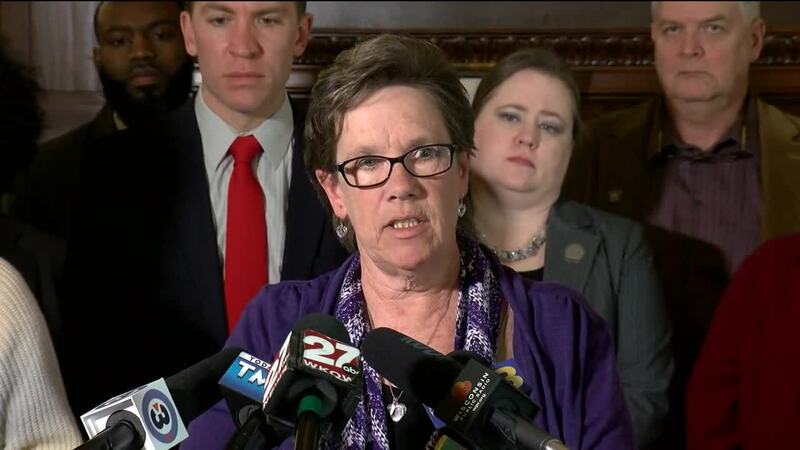 10:45 a.m. -- "No life has been untouched by drunk driving in this state," says Sen. Chris Larson (D-Milwaukee). 10:43 a.m. -- "Don't get behind the wheel if you're impaired. It's that simple," says Rep. Jim Ott (R-Mequon). 10:36 a.m. -- News conference begins. Watch live on the TODAY'S TMJ4 app. 10:30 a.m. -- Dawn Church carries this photo of her daughter Hannah who was killed in a drunk driving crash (shown in the photo on the phone). Dawn Church shows the photo of her daughter Hannah, who was killed in a car crash (shown in the photo on the phone). 10:25 a.m. -- These are OWI bills for the 2019-2021 Legislative Session. This is why these groups are gathered here at the State Capitol in Madison today. OWI bills in the 2019-2021 Legislative Session. 10:22 a.m. -- The microphones are in place; the cameras are set up. We are waiting for a news conference with Senator Chris Larson (D-Milwaukee), Representative Jim Ott (R-Mequon), and representatives from MADD - Mothers Against Drunk Driving. Microphone in place for a news conference with Rep. Ott, Sen. Larson, and MADD. 9:57 a.m. -- Project: Drive Sober team member Matt Jarchow meets with members of the Tavern League of Wisconsin. We spoke with the Brown County Tavern League president this morning. Says their priority today is legislation related to wedding barns obtaining liquor licenses. 9:52 a.m. -- Victim advocates gather outside Sen. Van Wanggaard's office for a meeting with his staff. Victim advocates gather outside Sen. Wanggaard's office in the State Capitol. 9:22 a.m. -- Marla Hall and her sister Caralee Butzine prepare to speak with Rep. Jagler. The representative was out of town touring flooding damage in Dodge County. Marla and Caralee spoke with his staff and plan to call him later this week. Marla Hall and her sister go into Rep. Jagler's office. 8:52 a.m. -- Project: Drive Sober team member Shannon Sims interviews Marla Hall whose son Clenton Hall was killed by a drunk driver in 2016. Marla will be talking to lawmakers today about supporting tougher OWI legislation. TODAY'S TMJ4's Shannon Sims interviews victim's advocate Marla Hall. 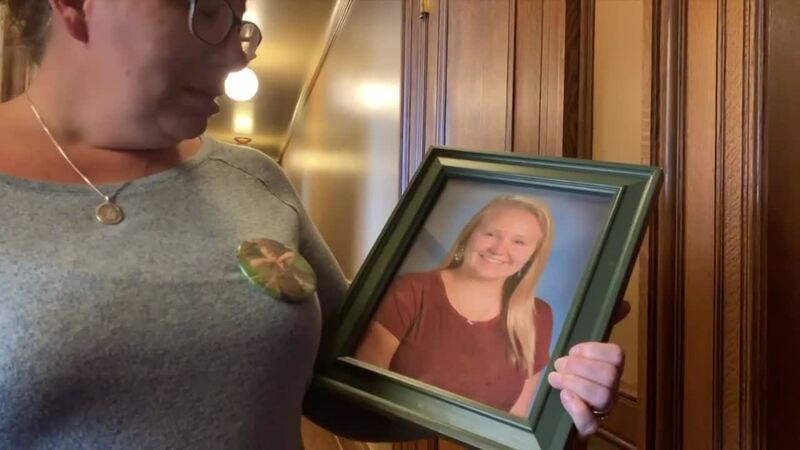 8:36 a.m. -- The Project: Drive Sober team is in the Capitol rotunda to interview Marla Hall whose son was killed by a drunk driver. She will be among the victims' advocates who will be visit lawmakers today. 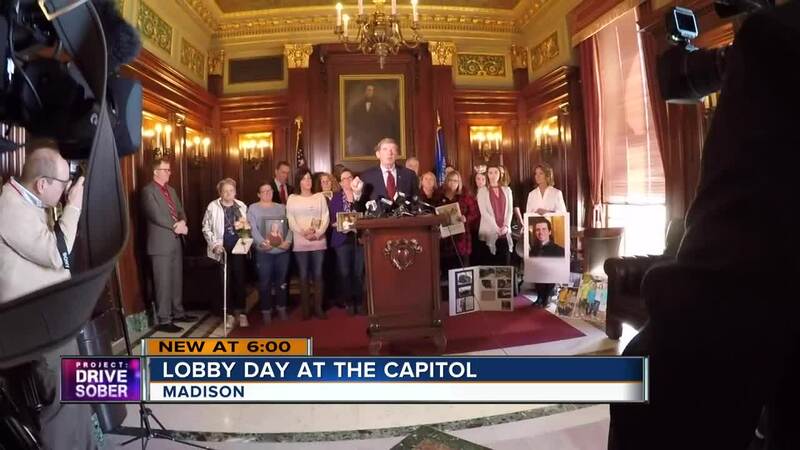 Project: Drive Sober gathers in the Capitol rotunda in Madison. 8:33 a.m. -- In case you missed it last night, check out Shannon Sims' breakdown of how the Tavern League spends its money in Wisconsin . They've spent nearly $470,000 on lobbying in the last three years alone.